We have not had a Christmas tree up for the past two Christmasses at Castle Codd. As soon as The Toddler Years hit, the floor space became a valuable commodity, and it just seemed to be more bother than it was worth. Russell really misses the Christmas tree, though, and if I have to look at his sad droopy puppy dog eyes every day from December the 1st for one more Christmas it will be too much. Additionally, my little boy has started to show and interest in Christmas and all of the shiny sparkle that it might possess. At a supermarket recently, a huge tree bedecked with lights caught his eye. I asked if he would like a Christmas tree at our own house this year. ‘Yes please, Mummy’. The deal is sealed. So, I am preparing a few decorations. I think a fair few of ours are toddler-friendly; the glass decorations to be put away until such a time as our son won’t break them (which I am guessing will be when he’s about 30) but I thought a few more toddler-friendly decorations cannot go amiss. I found this kit for four brightly coloured embroidered felt decorations in Hobbycraft for just £3, perfect for a bit of budget crafting. I’ve had a look online to see if I can find a link to this particular kit, but either my site search power is amiss or they are not for sale online. You can buy a digital pattern for both these and a whole range of other patterns from the designer, Larissa Holland’s, Etsy store, however. A big bonus to buying the kit for me, however, was that the pieces of felt were pre-cut. As I do not have a printer, printing and cutting the shapes accurately is pretty much impossible. Obviously, the kit worked out a far bit cheaper than buying the patterns and materials individually, too, though the felt is of a very hard, crisp quality, rather tough to sew through (though it holds shape fabulously when finished). The instructions for the embroidery are rudimentary at best. 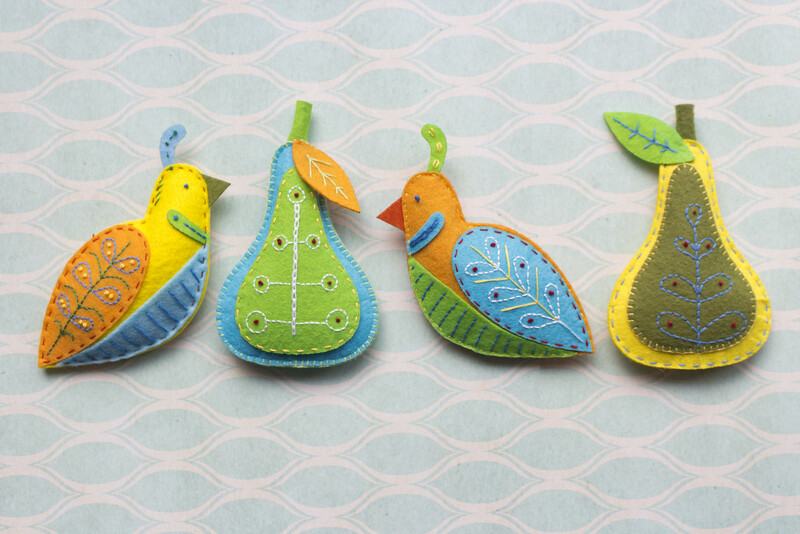 ‘Stitch a leaf design onto the green pear piece’. Looking at the design on the front of the kit, a stitcher with just a little experience, or a beginner with a bit of pluck and a simple guide to embroidery stitches should be just fine. 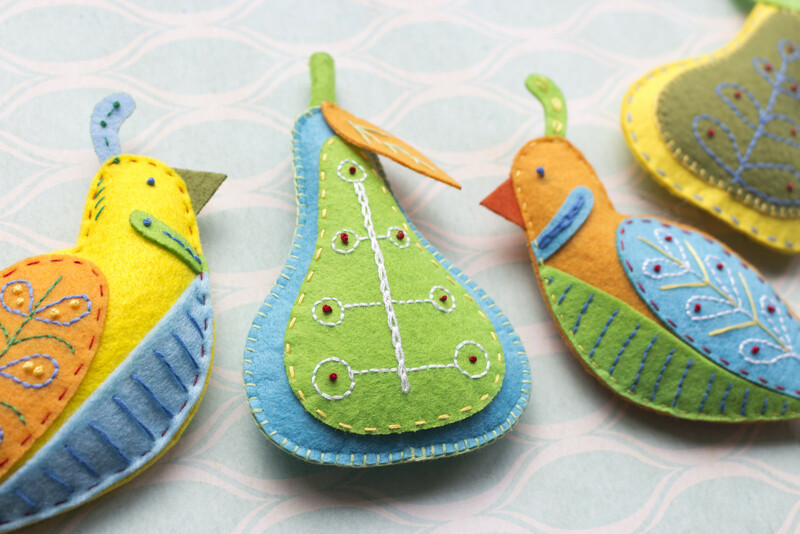 I’d recommend anyone stitching along to mark a general placement of the main lines of stitching, else your free-handing may result in a pear as fabulously wonk as my yellow pear, but nature’s wonkiest fruits are often the sweetest, so she can stay. 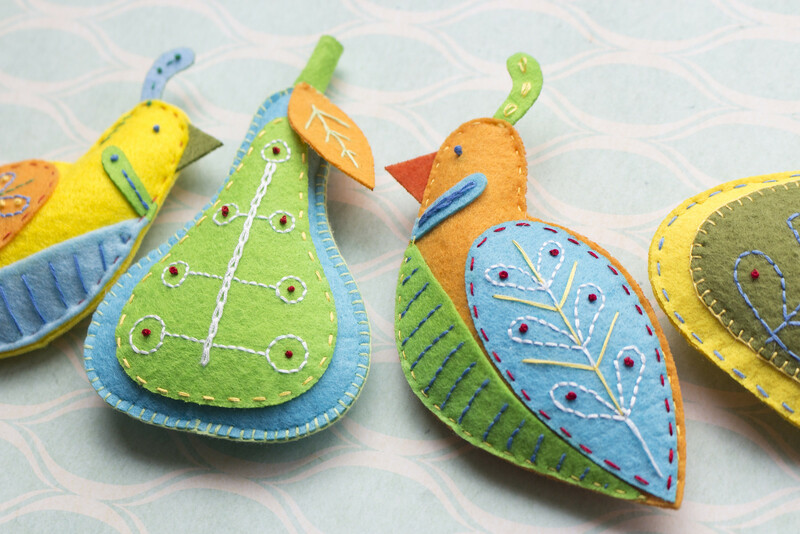 Two of the ornaments I stitched as close to the original designs as I could see/be bothered. The others I did in my own pattern, though they are very definitely variations on the original theme. I took me a day on and off to make these four decorations, which isn’t long at all for something so cheery that I am sure will grace our tree for a good number of years. Any other handmade decoration ideas out there? Are others gathering grand ideas and plans or are festive makes already truly under way?